LONDON, May 31, 2011 (AFP) - FIFA President Sepp Blatter's perennial enemies, the British press, on Tuesday wasted no time in sticking the knife into their embattled target after an ill-tempered press conference in Zurich. AFP - FIFA President Sepp Blatter gestures during a press conference on May 30, 2011 at the FIFA headquarters in Zurich. Britain's newspapers have regularly carried allegations against FIFA during Blatter's 13-year reign, and the country's journalists have been scenting blood after England's humiliating defeat in the race to host the 2018 World Cup. Tabloid The Mirror ran with the front-page headline "Bung to rights," with a picture of a pile of money allegedly used to bribe FIFA officials. Blatter dismissed talk of a crisis during Monday's conference, despite days of claims and counter-claims of corruption that saw two top officials suspended pending a bribery investigation. Another tabloid, The Sun, retorted with the front page headline: "Crisis? wad crisis?" and a photo of the money at the centre of the bribery allegations. "Shifty, arrogant, evasive...how shameful for world football that Sepp Blatter is likely to be re-elected unopposed as its head," the country's best-selling daily said. The tabloids and broadsheets agreed that Blatter's re-election to the game's top job on Wednesday would represent a travesty. "Blatter is such a flawed figure, set in his ways, larded in vanity, tainted by long years of wheeling and dealing, that there is no prospect of football putting its house in order while he remains at the helm," the Telegraph's Max Davidson wrote. The columnist also highlighted the contrast between the joyous celebrations at Wembley on Saturday, when an irresistible Barcelona team claimed the Champions League trophy, and the ongoing allegations submerging FIFA. The FIFA affair was, he wrote, a "farce of tragic dimensions at the heart of football." The Daily Mail's Richard Littlejohn took a similar view. "All we supporters can do is hold our noses and enjoy the spectacle of a balletic Barcelona side who have reminded us in spectacular style what we love about the beautiful game," he wrote. 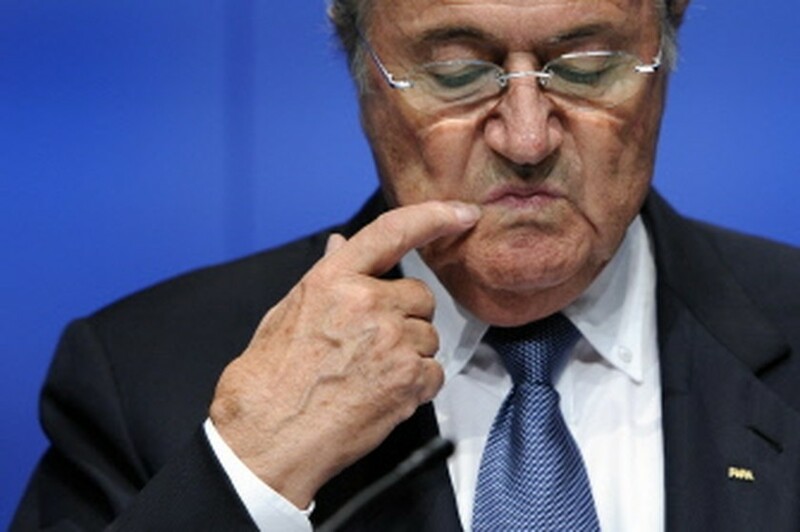 "Because, despite Blatter's risible 'crisis, what crisis?' routine last night, the stench from FIFA headquarters isn't going away any time soon.